When someone steals your belongings, whether it's a valuable or sentimental item, it's completely natural to feel outraged, but one thief has managed to turn things around and win sympathy for his crime. Singer Steve Valentine from Birmingham took to Twitter to reveal how his flatmate had received an email from a thief who had stolen the laptop, containing his university course work. 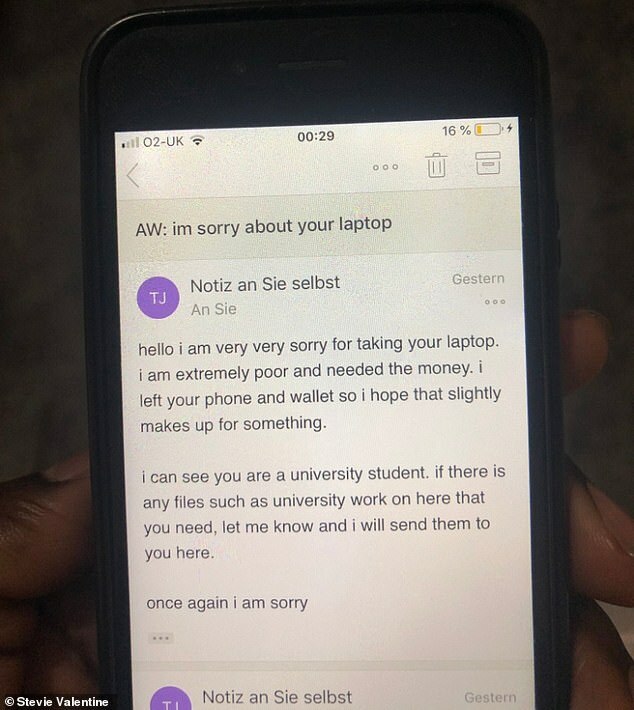 Apologising for the theft, they said they were poor and needed money but offered to send on any files the student might need for their course work. Stevie's tweet has now been liked 26,000 times with many people expressing sympathy for the person who pilfered the computer. 'I actually like this thief, I need help,' one wrote, while several confessed they would be happy to let them keep it after reading that explanation. The unnamed thief started the message by saying they were 'very, very sorry' for taking the student's laptop. 'I am extremely poor and needed the money,' they explained. 'I left your phone and wallet, so I hope that slightly makes up for something. A sympathiser even suggested that the laptop owner should reply and track the thief down and given them some money. And another consoled the victim of the crime, saying: At least he was kind enough to explain his situation. Another said that despite the email being sweet, the student is now left without their laptop and can't do their work, not to mention being on a limited budget themselves. And one joked that if the thief was really sorry they would offer to do the rest of the victim's coursework for them.